"The fact of the matter is that most actors are shy people." 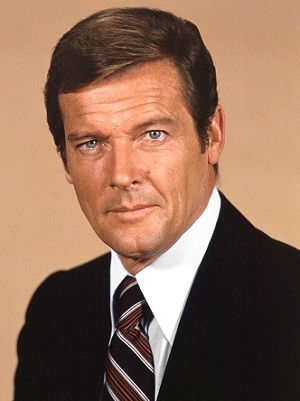 Sir Roger George Moore, thank you. Wait, what? That's not why you actually clicked this page, did you. Roger Moore's relationship with the series started with Live and Let Die and lasted until A View to a Kill. He was 45 when he started out, and almost 58 when he wrapped things up, with the longest tenure in number of films to date, at sevennote Sean Connery did appear as Bond in seven movies, but the seventh was Never Say Never Again, which was not produced by EON. Daniel Craig has been signed on for a fifth film but he is unlikely to match Moore's number, although his tenure in years has already equaled Moore's and will exceed it in 2019. His era is known for being very light hearted, often to the point of self-parody, making him somewhat divisive among fans of the series, and it is often debated how much of the self-parody was him and how much of it was the studio. Unfortunately Sir Roger's affection for the role fluctuated. It seems on one hand he loved the job, but on the other hand a great deal of I Am Not Spock feedback came from him. Reportedly, "Who's the best Bond!?" questions tended to leave a sour taste in his mouth (despite, you know, George Lazenby already having been there). Later in his life, he retired as an actor, but seemed all right with doing a cameo here and there, and put his celebrity to good use in humanitarian activities — most notably as a UNICEF Goodwill Ambassador, earning a knighthood in the process. He also filmed a role in the pilot for a new series based on The Saint, after having provided a voiceover for the ill-fated 1990s movie version. He passed away from cancer on May 23rd, 2017 at the age of 89. He is the first actor to play James Bond in the official EON film series (and, to date, the only one) to pass on. The Wild Geese: Lt. Shawn Fynn. Badass Baritone: His voice was very deep and authoritative. Badass Driver: Was a trucker before he was an actor and did most of his own stunt driving. The Cameo: Most of his post-James Bond career in a nuts hell. Cool Old Guy: UNICEF ambassador, knight, and incredibly charming. Does Not Like Guns: He was accidentally shot in the leg when he was 14 and his hatred of guns only grew stronger as he got older. Although many of his characters handled firearms, it took a lot of cajoling to get him to actually shoot them on camera and, oftentimes, those sequences were handled by stunt doubles. Fascinating Eyebrow: He probably did it better than Sean Connery. Gentleman Snarker: In real life, he was probably more of a snarker than Simon Templar and James Bond put together. Grandma, What Massive Hotness You Have! : Up until his facelift at 57, he was a stunningly handsome man. I Am Very British: Oh so very much. Large and in Charge: He was 6' 1½" (1,87 m), only slightly shorter than the two previous Bonds. Muscles Are Meaningless: Critics often mocked him for not looking tough enough to be an action star. Moore beat up Lee Marvin, one of the critics who was rather tough himself. Marvin later admitted that "Moore may not look it, but he is built like granite". Older Than They Look: He was three years older than Sean Connery, and looked about ten years younger in his first two Bond films. Quintessential British Gentleman: Both onscreen and out of it. Self-Deprecation: The foundation of his sense of humour. He described his emotional range as James Bond as "Left eyebrow raised, right eyebrow raised, eyes crossed whilst being strangled by Jaws," and expressed shock at never being nominated for an Oscar despite learning a whole two more facial expressions. He was also the only Bond who freely admitted to using stunt doubles, saying "Of course I do all my own stunts. I do all my own lying, too." Sharp-Dressed Man: So much so that all his suits for The Saint, The Persuaders!, James Bond, and a bunch of his other films and TV series were made by his real-life tailorsnote he'd actually steal the suits from wardrobe after filming wrapped both because they were very nice and because some were worth more than his pre-James Bond paychecks.